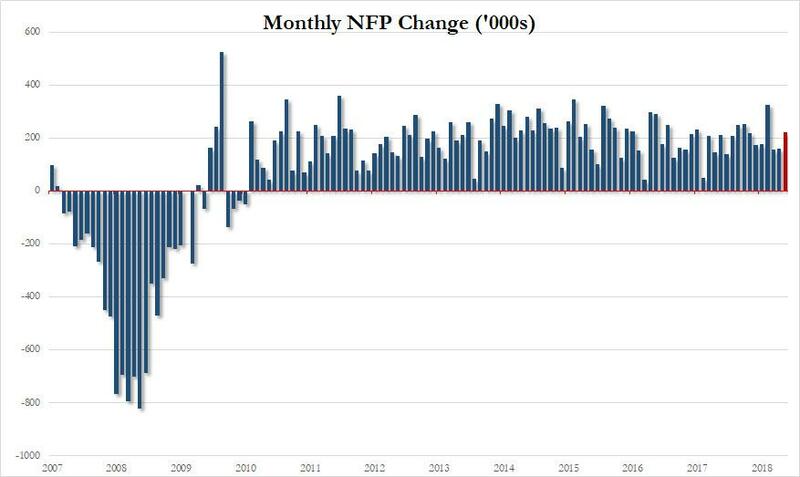 When we previewed the May payrolls last night we said that "after two consecutive and not immaterial misses, and 6 misses in the past 8 months, it's about time for a solid payrolls "beat", even if nobody cares anymore about the number of part-time waiter and bartender jobs created." Things got even more interesting this morning when Trump upped the stakes with his tweet that he was "Looking forward to seeing the employment numbers at 8:30 this morning", strongly hinting that he not only had seen the number, but that it would be a major beat. Well, perhaps not surprisingly, when the BLS revealed the answer moments ago, it reported that in May the US economy created 223K jobs, smashing expectations of 190K, and indeed confirming that Trump "may have seen been on to something." The change in total nonfarm payroll employment for March was revised up from +135,000 to +155,000, and the change for April was revised down from +164,000 to +159,000. With these revisions, employment gains in March and April combined were 15,000 more than previously reported. 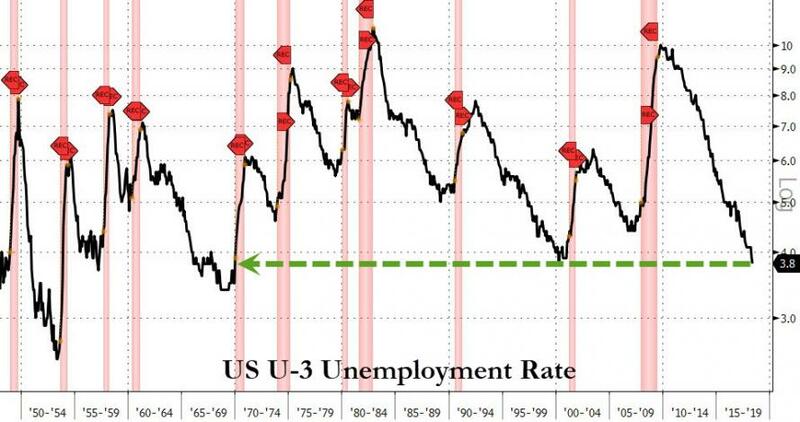 At the same time, the US unemployment rate dropped again, sliding to 3.8%, matching the lowest print hit back in April 2000, and the lowest going back all the way to November 1969. In fact, unrounded the unemployment rate was 3.755%, suggesting we were 0.01% away from a 3.7% print. Looking at the labor force, the participation rate dropped a tad to 62.7% as a result of a labor force which was unchanged on the month, while the number of employed rose from 155,181 to 155,474. 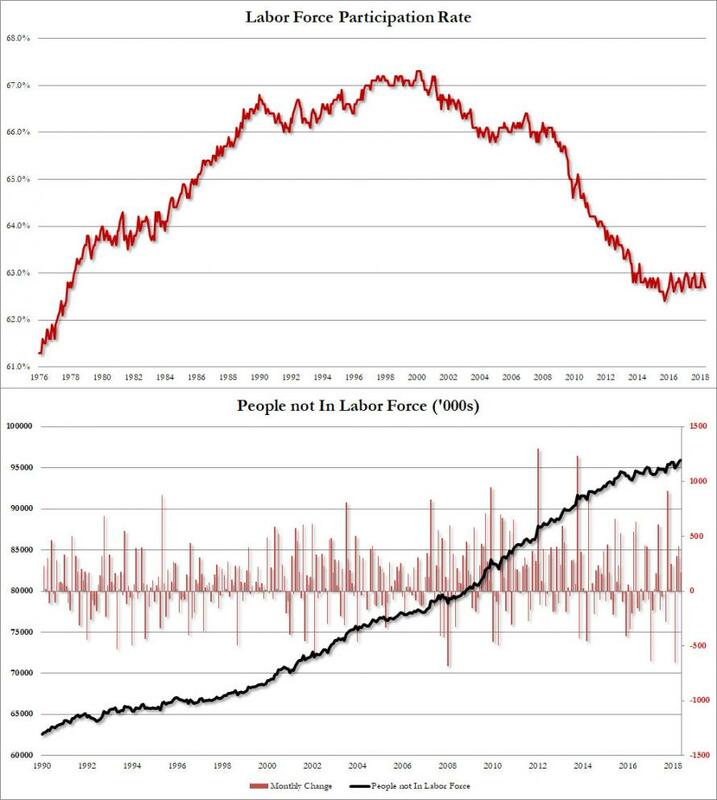 Meanwhile, the number of people not in the labor force hit a new all time high of 95.915 million. 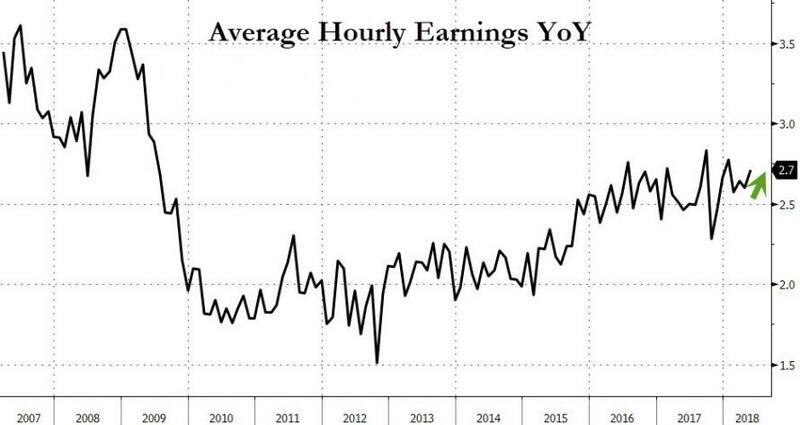 But Trump leak rumors aside, the most important number in today's report was the Average Hourly Earnings, which rose by 0.3% M/M, beating the 0.2% consensus, and up 2.7% Y/Y, also above the expected 2.6%, suggesting that wage gains may once again be on the table, and confirming that not only is a June rate hike guaranteed, but that there will be little to derail the Fed's tightening plans for a considerable period of time. The average workweek for all employees on private nonfarm payrolls was unchanged at 34.5 hours in May. In manufacturing, the workweek decreased by 0.2 hour to 40.8 hours, and overtime edged down by 0.2 hour to 3.5 hours. The average workweek for production and nonsupervisory employees on private nonfarm payrolls remained at 33.8 hours. 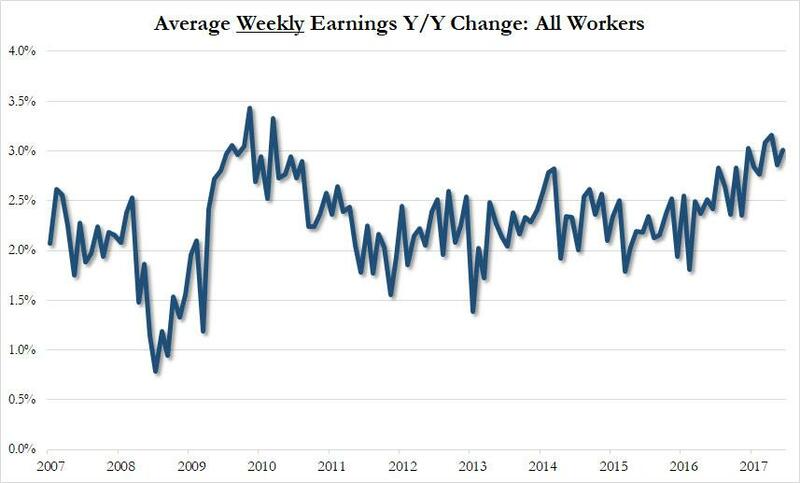 Meanwhile, average weekly earnings also beat, rising by 3.0% in May, up from 2.9%, and in line with the highest weekly increases since the financial crisis. Total nonfarm payroll employment increased by 223,000 in May, compared with an average monthly gain of 191,000 over the prior 12 months. Over the month, employment continued to trend up in several industries, including retail trade, health care, and construction. In May, average hourly earnings for all employees on private nonfarm payrolls rose by 8 cents to $26.92. Over the year, average hourly earnings have increased by 71 cents, or 2.7 percent. Average hourly earnings of private-sector production and nonsupervisory employees increased by 7 cents to $22.59 in May. The change in total nonfarm payroll employment for March was revised up from +135,000 to +155,000, and the change for April was revised down from +164,000 to +159,000. With these revisions, employment gains in March and April combined were 15,000 more than previously reported. (Monthly revisions result from additional reports received from businesses and government agencies since the last published estimates and from the recalculation of seasonal factors.) After revisions, job gains have averaged 179,000 over the last 3 months.